Planters Cheez Balls were an icon of ’90s snack food. Since being discontinued in 2006, passionate fans have pleaded for their return on social media. There was even a petition. In 2018, Kraft Heinz decided to bring the orange, nostalgic snack back. It needed to build excitement for Cheez Ball’s comeback, but it wanted to give fans a chance to reunite with their most-missed cheezy snack in a really fun way: A treasure hunt. It knew that fans yearning to find their beloved orange orbs would be willing to do what it takes to satisfy their 12-year-old craving and find cans hiding around the internet. To give fans clues about where to find the cans, Mr. Peanut released hints on Twitter. And it used ecommerce expertise to give the hunt an unexpected twist: Hiding the Cheez Balls on sites where people go to find long-lost treasured items — eBay, Craigslist and LetGo, definitely not your typical ecommerce platforms for CPGs. The can on eBay sold for over $2,000. 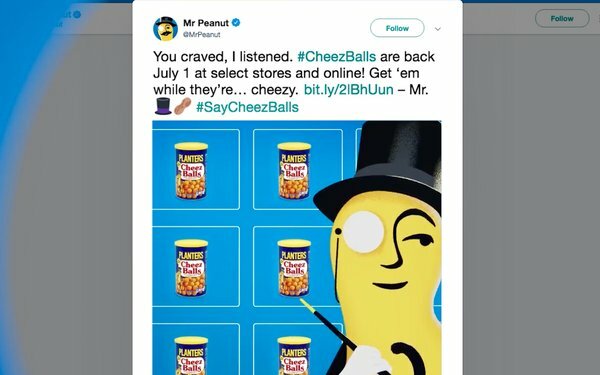 The lucky ones who found the cans hidden on other auction and ecommerce sites were able to purchase Cheez Balls and enjoy the nostalgic snack once more, sending Mr. Peanut tweets and pictures of cans once they received them. Then, Mr. Peanut announced Cheez Balls would be made available to everyone for purchase at retail and online. Build excitement for your product by creating a game for its fans. Use an iconic character to interact with your target audience. Create surprise by placing game clues on sites that traditionally do not attract CPGs. This won the Online Media: Branding category and was a finalist in the Performance Media & Marketing category in MediaPost’s 2018 Creative Media Awards.